The need to serve and care for others is a powerful one, and if a person is able to transform that need to a meaningful career path, it’s all the more rewarding. Presently, there are over 2.8 million nurses in the United States, making them the largest group of health care professionals in the nation. Yet, there still aren’t enough nurses to meet the increasing demands of a growing population, especially Americans over age 65. Does the United States have a shortage of nurses? One of the biggest crises the medical industry is facing is a severe shortage of skilled nurses. For the past several decades, the United States has had a shortage of nurses, however, as the Baby Boomer generation is aging -- and developing many of the chronic conditions that come with getting older -- that shortage will be felt harder in the future. For those interested in pursuing a career in nursing and helping to ease this shortage, we’ve compiled information on current nursing employment and wages in various states. Salary and job opportunities vary greatly for nurses throughout the United States. The information we’ve gathered may help you figure out which location and nursing industry focus suits you best. Which states have the highest need for nurses? In terms of hourly mean wage and annual mean wage, California tops the list once again with a $48.92 hourly mean wage and a $101,850 annual mean wage. The state closest to California in terms of wages is New York with a $33.84 hourly mean wage and an $80,830 annual mean wage. While New York State comes in second in terms of the highest wages for RNs, its largest city -- New York City -- leads the way in terms of the highest number of employed RNs in metropolitan areas throughout the U.S. New York City is home to 123,640 RNs. This metropolitan area encompasses not just New York City, but also parts of New Jersey and White Plains. The Los Angeles metropolitan area (which includes, L.A., Long Beach, and Glendale) has the second-highest number of RNs in the region, with 69,610 nurses. 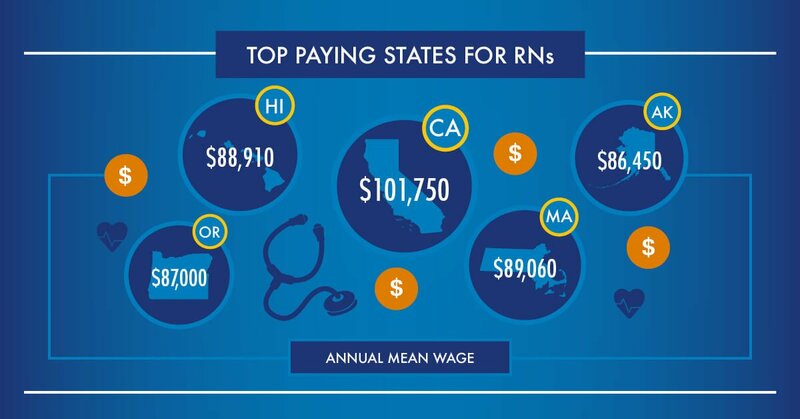 Massachusetts is the only East Coast state among the highest paying states for RNs, whereas the other four states that round out the top 5 are located on the West Coast or outside of the continental U.S. Which Metropolitan Areas Pay RNs the Most? Although California leads the way in terms of states that pay the highest annual mean wage for its nurses, its largest metropolitan area, Los Angeles, comes in second on the list of areas that pay their RNs the highest salaries. Boston, Massachusetts is at the top of the list, paying RNs an annual salary of $98,040 -- the highest in the nation. While some states and metropolitan areas pay higher nursing salaries than others, an important factor is considering just how liveable a wage an RN can expect to receive when moving to a certain area. Although some areas have higher wages for RNs, that wage may not be in line with the cost of living in a given region. Based on the annual mean wage of RNs and the cost of living per state, the top two states for nurses to work in are Nevada and Texas. Nevada has a 101.6 rating on the cost of living index, coupled with an annual mean wage for RNs of $83,790 per year. Texas is lower on the cost of living spectrum (90.4) and gives nursing professionals the opportunity to bring home $70,390 each year in terms of annual mean wage. Recent statistics show that 1,649,480 RNs in the U.S. work in the general medical field, which includes hospitals and surgical hospitals. At 57.7%, this concentration houses the largest number of RNs employed in the industry. The second-largest percentage of nurses (6.9%) in the U.S. are employed in physician’s offices. Following shortly behind, 179,280 RNs in the industry are employed in the home health care services field, tending to elderly patients who require care, yet choose to age-in-place in their own home rather than going to a care facility. They account for 6.3% of all nurses in the profession. Another 5.5% of RNs (157,530) throughout the U.S. are employed in the nursing care facilities field. These skilled nurses can also provide care to patients with a debilitating illness, such as Multiple Sclerosis or late-stage Alzheimer’s, giving them the option to live at home while receiving care. Outpatient care centers provide jobs for 128,180 RNs, with this sector comprising 4.5% of the nursing landscape in the U.S. The remaining 19.1% of all RNs in the nation are employed in other fields. According to the Bureau of Labor Statistics, there are very small percentages of RNs employed in areas such as accounting, consulting, or hyper-specialized areas that aren’t noted specifically within their survey. At present, there are a total of 546,170 RNs in the U.S. who make up this employment category. What type of setting do nurses work and specialize in? 30.5% of RNs make up the general medical field and hospitals, with doctors, anesthesiologists, and other medical professionals rounding out the remaining 69.5% of this employment category. In physicians’ offices throughout the U.S., nurses account for 7.8% of medical professionals in this field. Outpatient care centers across the country have a 15.4% share of nurses who make up these ambulatory care units. Their role is to care for patients who do not require an overnight stay in a hospital, or to look after patients who have a shorter recovery time following surgical procedures. In the home health care services line of work, 13.2% of the field is made up of RNs. There is a 9.6% share of RNs who are employed by outpatient care centers, with rehabilitation specialists and other medical professionals comprising the remaining 89.4% of those in this field. 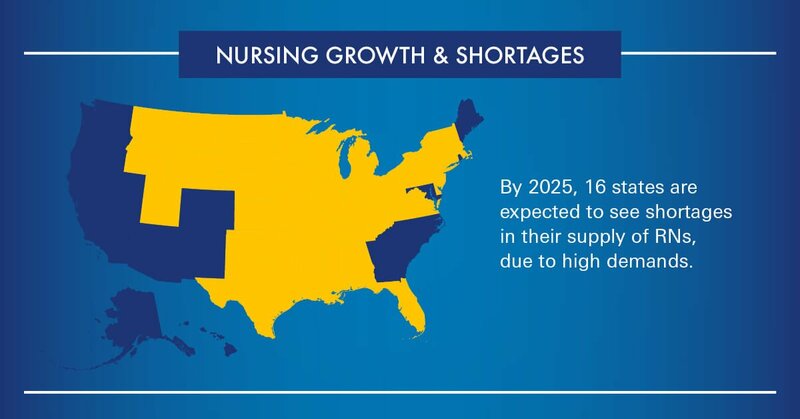 What is the projected growth for nursing? Despite the current shortage of nurses and the exponentially growing shortage of nurses in the near future, the Institute of Medicine made a strong recommendation in 2010 that 80% of the nursing workforce have a baccalaureate degree (BSN). The rationale behind this recommendation is that “research has shown a higher percentage of baccalaureate nurses on a unit reduces morbidity and mortality,” says Tina Gerardi, the Deputy for the Academic Progression in Nursing Programs (APIN). The number of nurses with a BSN has increased steadily since 2010. Previously, only 50% of nurses had a BSN degree, but that number has increased to approximately 60% as of 2016. Today, 43.7% of hospitals and other health care providers are requiring new hires to have a bachelor’s degree in nursing, and 78.6% of employers prefer BSN graduates. With the growing need for nurses and opportunities opening up for skilled RNs across the country, there is no better time than now to start earning your nursing degree and set course for a rewarding career. Learn more about Drexel University Online’s accredited nursing programs and find a degree program that’s right for you!